A Christianity Today 1999 Book of the Year! Who was the real Paul? Some of Paul's contemporaries seem to have asked the same question. For some he was Paul the tentmaker. For others he was Paul the heretic, Paul the peripatetic philosopher, Paul the would-be apostle, Paul the prophet, or Paul the founder of Christian communities and missionary hero. For more than a decade there has been a renewed quest for the real Paul behind the Acts of the Apostles and the collection of Pauline letters. Although this quest has not gained the visibility of the renewed quest of the historical Jesus, it is a thriving enterprise joined by Protestant, Catholic and Jewish scholars as well as those interested in Paul as a figure of the first-century Greco-Roman world. One of the great gains of this quest for the historical Paul has been a fresh encounter with Paul the Jew. The flood of new insight into Judaism of the first century has illuminated features of Paul that were previously obscured. A scholarly reacquaintance with the classical Roman world has filled in even more details. In this book, Ben Witherington III examines and evaluates the various profiles of Paul that have been newly discovered or recently refurbished. We encounter Paul as an ancient Mediterranean personality and watch him operate in a social environment where honor, shame, patronage and corporate identity are daily considerations. We discover new dimensions of Paul's epistles as we observe him dictating letters and gauging his rhetoric. We enter into the field of controversy where Paul the apostle and prophet meets his opponents. We reconsider the nature of the human body and Christian community as we meet Paul the anthropologist and champion of woman and slave. Paul, the man of the big idea, shows himself to be in truth a storyteller and interpreter of Israel's holy history. In and through all of these complexities, we discover Paul to be a consistent and coherent theologian and ethicist whose thinking reaches out across nearly two thousand years to engage men and women today. 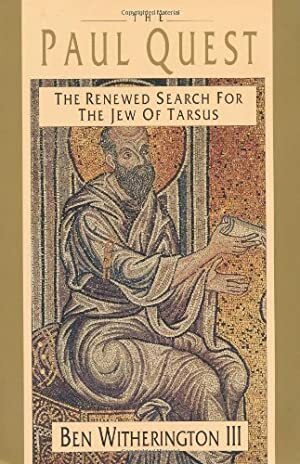 With The Paul Quest Witherington leads an exploratory tour and reappraisal of the historical Paul, a sweeping survey of the contemporary rediscovery of the Jew from Tarsus. Track It. This book has been $16.02 within the past year. Log In to track Ben Witherington III on eReaderIQ. to be notified each time the price drops on any book by Ben Witherington III. to stop tracking Ben Witherington III. We started tracking this book on April 8, 2013. This book was $14.40 when we started tracking it. The price of this book has changed 108 times in the past 2,202 days. The current price of this book is $22.14 last checked 4 hours ago. This lowest price this book has been offered at in the past six months is $17.80. This lowest price this book has been offered at in the past year is $16.02. The lowest price to date was $14.40 last reached on April 8, 2013. This book has been $14.40 one time since we started tracking it. The highest price to date was $34.99 last reached on November 23, 2017. This book has been $34.99 2 times since we started tracking it. We last verified the price of this book about 4 hours ago. At that time, the price was $22.14. This price is subject to change. The price displayed on the Amazon.com website at the time of purchase is the price you will pay for this book. Please confirm the price before making any purchases.